I was in central London today. Not as a Trump protestor, you understand, but just mooching down the Euston Road on my way home from the station. A little before midday, I stopped for a coffee beneath Euston Tower and was reminded of it’s days as “The tower of power”, the home of Capital Radio from 1973 to 1997. 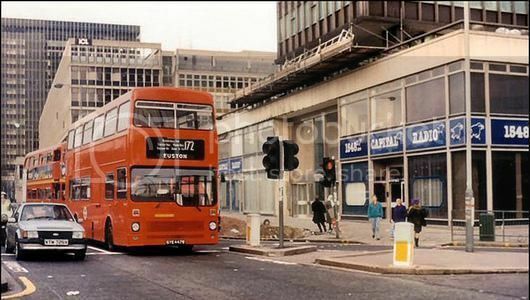 Capital Radio on 194 and 95.8 was a great listen growing up. It was, after all, the home of my fave DJ Kenny Everett. It was vibrant, innovative and had a brilliant playlist that was broad and distinctive and not just a rotation of the chart hits. They played classical music, broadcast plays and did a weekly disco live from The Lyceum Ballroom. Services such as the Capital Help Line, it’s flatshare list, the Flying Eye and Help a London Child events made it a true community radio station, long before the term had been invented . It even had it’s own orchestra, The Wren. Capital was chock full of engaging personalities. As well as the music jocks, talk presenters like Anna Raeburn (agony aunt), Monty Modlyn (roving reporter), Joan Shenton (features reporter) and Adrian Love (phone in host and interviewer) each contributed a warmth and friendliness that made you feel like you knew them and they knew you. Capital FM traded on the “tower of power” theme during the 80s. You got the impression the presenters were perched in studios high above London at the top of the Euston Tower skyscraper. In reality, they occupied only the first couple of floors. Perhaps the station antennae were on the roof? The ground floor windows on Euston Road had photos of the presenters of the day. And of course, there was the Capital Radio shop with its car stickers, pens, notebooks and tshirts and the famed circular staircase that led up to the studios and offices. The Capital Fun Bus, a converted routemaster, would tour the parks and open spaces of London, with the jocks of the day playing tunes and giving away prizes. I remember it pitching up our very own Wandle Park one summer. Sitting at the base of Euston Tower at midday today, I was reminded of my Saturdays spent listening to Kenny Everett and feeling strangely guilty if I had to leave the house whilst he was on. It’s funny to think that forty years ago, at this very spot and this very time, Everett would have been making his way into Capital to do his show. Time flies. Radio time flies even faster. Capital moved from Euston Tower more than 20 years ago and today occupies a prime spot on Leicester Square in a building housing a bunch of other Global stations. I haven’t listened to Capital in years but still have fond memories (and probably a few dusty cassettes) of London’s original commercial radio station. Posted by Tim Longhurst on Sat 14 Jul 2018.